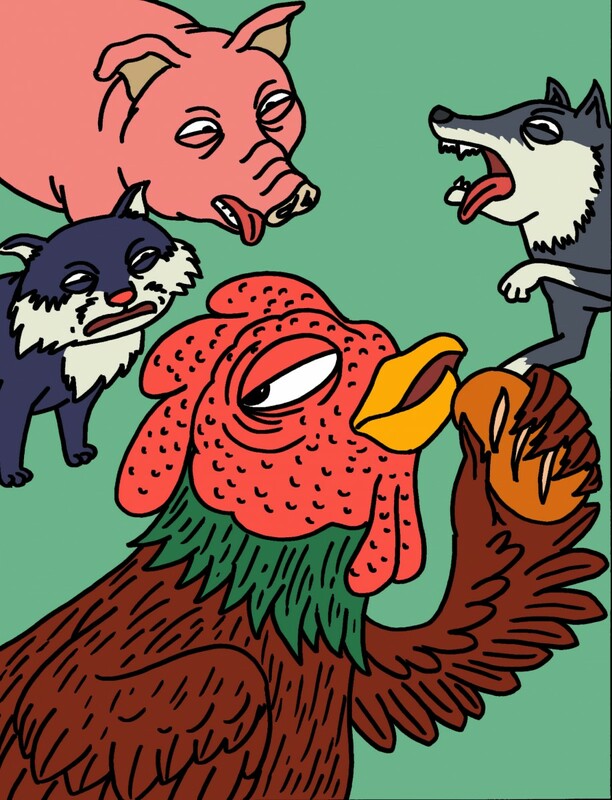 A pig and a dog and a cat live with a Little Red Hen. They all lived together in a little white house that was surrounded by good land. One day, the little red hen decided to plant some wheat. "Who will help me plant my wheat in my garden?" asked the Little Red Hen. Then I shall plant the wheat myself," said the Little Red Hen, and she did! She took her sharp toes and dug them into the ground. She loosened the soil and took the seeds in her beak and flipped her head from side to side to spread the seeds. Then she scratched once more with her feet to cover the seeds with dirt. The Wheat began to grow, and at first began to look like grass. "Who will help me water the wheat?" said the Little Red Hen. "Then I will water the wheat myself," said the Little Red Hen, and she did! She carried water up the hill from the river, carrying the bucket handle in her beak - with the bottom of the bucket banging against her ankles with each step she took. She dipped her wing feathers into the water and fluffed her feathers out time after time. This made the water fall on the wheat like gentle drops of rain. The wheat grew tall and before long was ready to harvest. "Who will help me cut the wheat?" asked the Little Red Hen. "Then I will harvest the wheat myself," said the Little Red Hen. And she did! She leaned forward and snipped each stalk off at the bottom using her beak. Then she used her toes like a rake to stack the wheat stalks into bundles called sheathes. She bent over and used her neck and head to scoop the sheaths of wheat and put them between her wings on her back. Then she took the wheat to the mill. "Who will help me thresh and grind the wheat?" asked the Little Red Hen. "Then I will thresh the wheat myself," said the Little Red Hen, and she did. She ran in circles around and around on top of the sheathes of grain until her feet had knocked every grain of wheat off the stalks. Then she turned her back on the pile of wheat and flapped her wings with all her might. She created a breeze that was so powerful that the straw (or stalk) blew away and only the kernels of wheat were left. Then, she grabbed the rope that turned the mill in her beak and pulled it using the strength in her legs and back to pull it round and round the mill to turn the grinding stones and turn the wheat into flour. "Who will help me bake the bread into flour?" asked the Little Red Hen? "Then I will harvest the wheat myself," said the Little Red Hen, and she did! She used her beak once again ? this time like a scoop to measure out the flour. She took two of her eggs that were not fertile and added them to the flour. Then, she added salt, baking powder, and water. The Little Red Hen used her toes to kneed the flour and turn it into dough, and she put it into the oven to bake. The bread smelled delicious! The Pig, the dog and the cat came to the kitchen to smell the bread as it was baking in the oven. Soon the bread was done. The Little Red Hen put the pan with the bread in it on the counter to cool and soon put the bread on the table. "Who will help me eat the bread?" asked the Little Red Hen. "I will," said the pig. "I will," said the dog. The Little Red Hen looked at the pig and the dog and the cat. "You did not help me plant the wheat. You did not help me water the wheat. You did not help me cut and thresh the wheat. You did not help me grind the wheat. You did not help me bake the bread, and now I will eat the bread by myself." And that's exactly what she did!